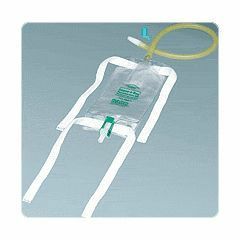 Bard Dispoz-a-Bag Leg Bags are made from heavy duty vinyl for extended wear, odor containment and leak resistance. Each leg bag contains an anti-reflux valve that reduces risk of back flow, which reduces the chances of infection. So easy to use. Very easy for me as a quad to open and close, yet you do have to be careful getting undressed so you don't tap it open. Best bag out there in my opinion. Picture didn't show drainage hose. Didn't want drainage hose. Called 800 number asked rep. to make sure. Rep said no hose with this one. Hose came. Go figure. Like the product just wish you get what you actually want. Easy Storage. Sturdy. Lightweight. Safe. Easy to drain and clean..
To collect urine draining from condom catheter. Easy to attach to leg and easy to empty while in a wheelchair. After two to three months of use it begins to tear and leak. I use a new bag and Foley each week, never disconnecting. Pin to side of bed at night, open drain valve, drains into milk jug. No more stinky pee, UTI's. Urine leaking out of clear tube (3 tube: 1 to bag, 1 with red end, 1 clear end, and 1 white end connected to bag. What's wrong/solution? we have the "leg bags" and what we call "overnight bags". These have a longer tube and my be hung from a bed or left on the floor.